Fox scored a game-high 30 points (11-17 FG, 2-4 3Pt, 6-8 FT) while adding eight assists, five rebounds and a steal in 37 minutes during Saturday's 102-94 win over the Knicks. 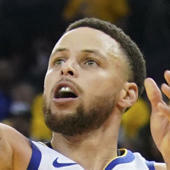 Twelve of his points came in the final six minutes of the game, as Fox nearly single-handedly staved off a late push by New York. It's the third time this season he's popped for 30-plus points, and the second-year guard's breakout campaign has solidified his spot as one of the foundation pieces for a rebuilding Kings squad.